I was completely mesmerized by this Dwell Article featuring Erik Spiekermann’s house. What a stunning place to call home. I could move in as is. (I don’t say that often) It seems like him and his wife also follow the same no-clutter policy G and I subscribe to. 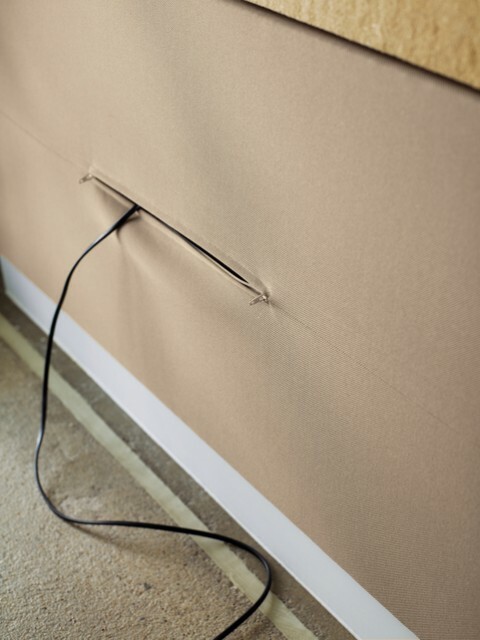 What a cool idea about having cloth panels hide messy outlets and plugs. The little detail that sealed the deal for me is the remote-controlled mountaineer’s harness that let’s you peruse the two-story bookshelf. Now that is *cool*! Impressive… My kids would be all over that bookshelf. If it works for him and his family, super. Feels like a laboratory: cold, sterile, and not inviting. When I first saw the cloth panels I though, “Hello? Fire hazard anyone?” but I suppose it depends on the type of cloth. I think their kitchen is from the same company one of my best friends in Germany had his kitchen designed by. It’s a pretty stunning and compared to what you would pay for something similar in the US or Australia actually not that expensive. Actually coming to think of I think you couldn’t build a house to those specs and in that quality anywhere but Germany. You really get great value for your money. @Alberto… that makes two of us! If he is that pedantically clean, he must be a very difficult to get along with in person. Vast bookshelves + mountain harness aside it has all the appeal of a vet’s surgery… bbbrrrrrrrrrr! I have to agree with delboy, Nathan and Juhan. It feels so cold, sterile and uninviting. I do not like clutter either, but a house should still have a “lived-in” feeling. Even though the bookshelf is fantastic, I am missing the place where I could cuddle up with a nice book. This house looks like a candidate for “Unhappy Hipsters”. I agree with Juhan and Barbara. Trust a graphic designer to go for that bookshelf idea :-) Not really modernist in principle though, is it? Functionality and all that. Reminds me of the one designer joke I know: How many designers does it take to change a lightbulb? Only one – but does it have to be a lightbulb? I am missing the place where I could cuddle up with a nice book. we have plenty of those, but the editors obviously decided only to show that one aspect. And i wish i was pedantic about cleaning up – there is way more clutter than you think. If you ever had a photographer in your house then you know that they move things out of the way to get a clean shot. Take it all with a pinch of salt or come to Berlin to see for yourselves. Good Lord: I would not want to clean that kitchen after a good cooking. Too many shiny surfaces. The looks are great but not very useful in everyday life-if you cook. Wrong: a quick wipe-down with a wet cloth is all it needs. And now and again a bit of glass-cleaner and a dry cloth. Stainless steel is very forgiving. Clearly well designed kitchen but so cold and drab, it makes we want to use the chef’s knife to cut my own wrist. I cannot believe anybody can make such a sweeping comment from one or two pictures. 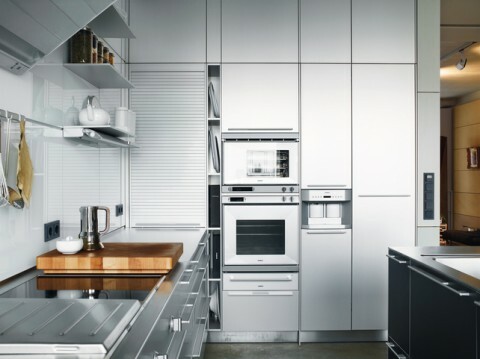 The kitchen is neither cold nor drab, but very practical, easy to clean and never empty. Food and drink make it a kitchen, not bits of stainless steel. And as we cook a lot, there is always food and drink around. Just not in any of the pictures. Erik, great space! The openness and abundance of natural light looks to have captured what the original design for your’s and Suzanna’s place in SF sought to accomplish.